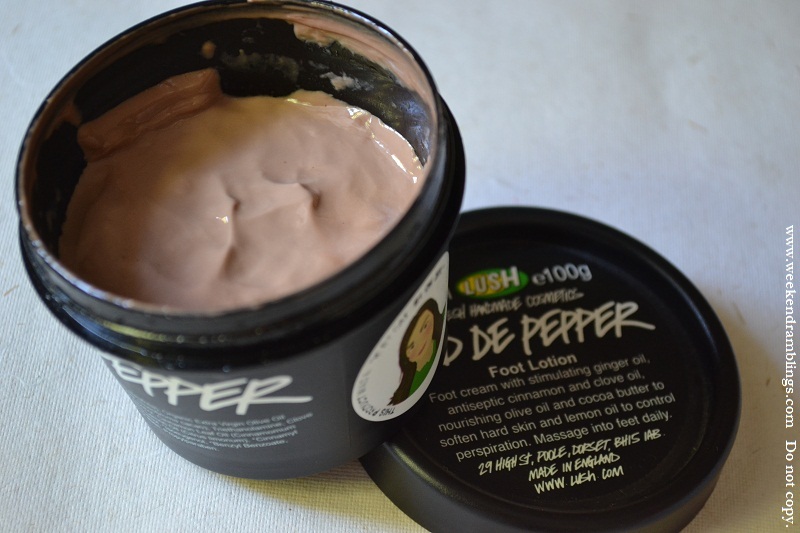 Lush Pied De Pepper Foot Lotion - spicy cream to relieve foot pain and soothe sore feet after exercise. 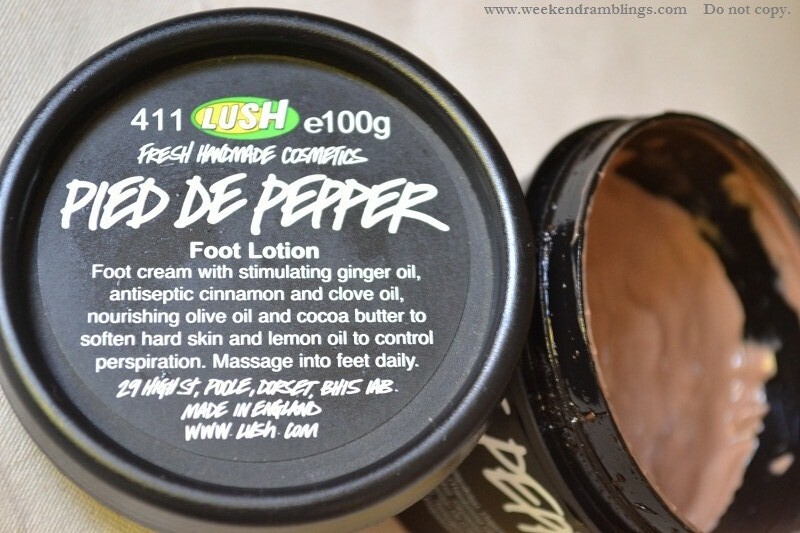 I bought Lush Pied de Pepper foot lotion a while back, in time for winter, because I remember reading somewhere that this warms up your feet. Pied de Pepper is excellent in cold weather for people who have cold extremities and like to warm their feet up on yours. They were talking about me! I just HAD to pick this up. 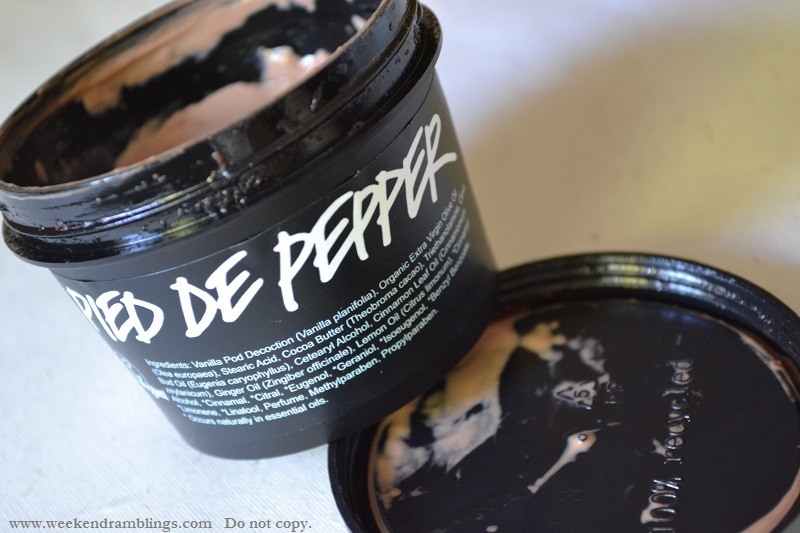 How to Use the Pied de Pepper foot lotion: Smooth over clean dry feet. For extra moisturizing, apply extra lotion to feet, wrap in plastic and keep on for an hour. Or, try applying at night and covering with clean cotton socks. The foot lotion is a very thick brown-pink product. I have read reviews mentioning that this stains skin and/or bedsheets. I haven't had any such problems. I was expecting this to warm my feet up, slather this on and have warm feet forever. Nope. That does not happen. What the Pied de Pepper foot lotion does do is give a bit of a tingling sensation to the skin, probably because of the spices, and this might seem to be a bit warming for some, but not so much for me. There is a strong sharp medicinal smell to the lotion that reminds me of Iodex or Vicks and is very similar to the Lush Wicci massage bar. This isn't a smell I particularly like. The sharp spicy smell, though, might be great for people who are using this in the summers as it will definitely keep off foot odor. I find this a very light lotion - too light for my needs. Coupled with the fact that it didn't provide the warming sensation that I had perhaps falsely expected, this is definitely not my favorite foot lotions. It does moisturize my feet, but I need to reapply in about 8 hours - my feet would look like they hadn't been moisturized at all by then. It's not all bad, though. While I find this lacking in its moisturizing abilities, I do feel the lotion works best for tired feet. Take the time to soak your feet in some warm water, scrub them, and slather on this lotion. Massage and slip on comfortable cotton socks. Your feet will thank you. Geraniol, Isoeugenol, Benzyl Benzoate, Limonene, Linalool, Perfume, Methylparaben, Propylparaben. As with most Lush products that come in black tubs, return 5 black tubs to get 75 g of fresh face mask of your choice. Oh same pinch! My feet and hands get really cold.. but this doesnt really warm you up eh? Too good to be true! Oh I have one from Burts Bees - some peppermint lotion. It that the one? I don't think I would mind the smell. I have tried Godiva and Retread also smells a bit of jasmine. Strokes - I will wait for your review on it. Oh okay..no I have a peppermint foot lotion. Will look out for the coconut version next time.